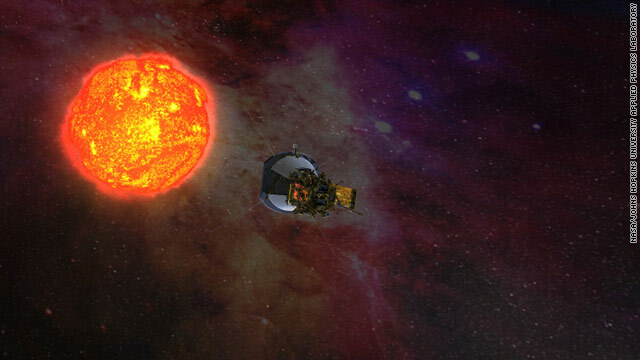 The planned Solar Probe Plus approaches the sun in this artist's rendering. There's a new spacecraft being designed to study the sun: the Solar Probe Plus, managed by a team at Johns Hopkins Applied Physics Laboratory, or APL. The scientists behind it aim to answer two fundamental questions: why the sun's atmosphere is hotter than its surface, and what's responsible for accelerating solar wind. Part of NASA's Living With a Star program, which looks to study how the sun, solar system and Earth interact, the Solar Probe Plus would break new ground in science with regard to our central star. "Solar Probe Plus will revolutionize our knowledge of the physics of the origin and evolution of the solar wind," Nicky Fox, Solar Probe Plus project scientist at APL, said in a release. Before the Solar Probe Plus can fly though, the APL team has to make sure it can withstand solar radiation, minuscule dust particles and temperatures more than 2,550 degrees Fahrenheit. NASA has just given the team the go-ahead to move from the first round of concepts to designing and testing components such as a carbon-carbon composite heat shield and a cooling system to protect the craft's solar arrays. The probe, which will be about the size of a small car, will carry instruments to measure particles in the solar wind, the sun's magnetic and electric fields, radio emissions in the sun's plasma and elements in the atmosphere. "Solar Probe Plus presents technical challenges like no mission before it," said Andrew Driesman, Solar Probe Plus project manager, in a statement. "Our goal is to get these technologies to the point where we have full-scale prototypes that we can test in a realistic environment." The probe is scheduled to launch in 2018.
lets say you had a spaceship that could fly at the speed of light. this is alactuly impossible unless you rip spacetime, but we'll ignore that. you blast off from earth, travel to the end of the known universe, and come back. every one on earth thinks that you've been gone for about 26 billion years. this is because the edge of the known universe is 13 bilion light years away. for you, however, it will alactuly take ZERO time. this is because time slows for a very fast moving object, and alactuly stops for one moving at the speed of light. you could travel to every point in the universe, including the ones that are too far a way to see, and your watch wouldn't tick once. you wouldn't even see what was happening because light wouldn't reach your eyes and your brain couldn't process the information. i would be surprised if it doesnt burn up before the first orbit is complete.asking why the atmosphere is hotter than the surface is like asking why the catalytic converter is hotter than any part of your car engine.